What this graph shows is that we have a nice bell-shaped curve indicating that our ratings are normally distributed. In other words, there were a lot of movies that were average (3 Reels) and relatively few that were terrible (0-1.5 Reels) and relatively few that were great (4-5 Reels). This graphic shows that (roughly speaking) the quality of a movie is related to the quality of the hero. 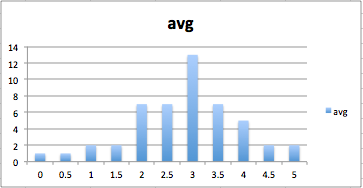 There is a blue line through the middle of the graph represents the median (3.0 Reels). The gray area represents the months of January through April as well as October. Most films in those months were rated as 3.0 reels or less. 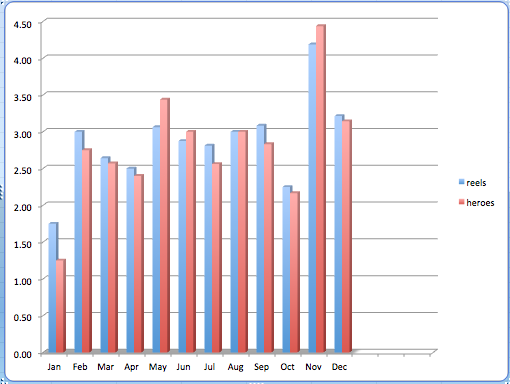 Then during the yellow months (May-August) the ratings hover arond 3.0 (with an occasional spike). Finally the blue months (September, November, and December) had great ratings in the high 4.0-5.0 Reels. So there is a reason that our “Best Films of 2013” picks favored movies that we saw more recently – the movies at the end of the year are actually better than the ones at the beginning of the year. Thanks to David Thomas for his posting from our “Best Films of 2013” analysis from last January. By Greg Smith in Commentary on June 5, 2014 .